Sue joined The Woody Financial Group in Overland Park KS, an Agency of The Guardian Life Insurance Company of America (Guardian), in February 2010. She currently, is the General Agent's assistant along with being the brokerage assistant for disability insurance. Within these positions she assists the general agent with administrative duties, process all broker contracting paperwork, runs illustrations, reviews disability applications, orders exams and medical records as needed for underwriters, provides status correspondence to Agents, Brokers and Supervisors, and process delivery requirements to complete disability applications. In addition, she also assists with all of the firms fundraising efforts from adopting a family at Christmas time to chairing events for The Leukemia and Lymphoma Society on behalf of The Woody Financial Group. Sue received her Associate degree from American Institute of Business in Sales and Marketing along undergraduate degree from Loras College in Business. 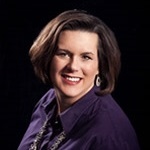 Sue currently lives in Basehor, KS with her husband Mark, son William and daughter Addison. In her free time she enjoys scrap booking and spending time with her family and friends.